Super Hero Boy: I'm making mommy a salad! I'm making mommy a salad! Oh my precious beautiful child, though he drives me absolutely nutty sometimes and makes some pretty big messes, he always seems to know when mommy really needs his help. This pregnancy verses Connor's pregnancy has been no walk in the park and for the most part I've not been in the mood till recently to eat much of anything it seems that consistently the one thing I craved with both boys was salads. The problem is I tend to crave salads as the most inconvenient time and never when I actually have the veggies to make them in the fridge. Connor however has his mommy's back and he took it on himself to make me one the other day. Learning Resources is quickly becoming one of our favorite toy companies. The reason is quite simply the quality of the toys and the imagination factor which is HUGE for us. Though I think everyone is impressed by the high tech toys that are available these days and sure we own some of them, the toys I really love are the ones that really challenge your child to think and be creative on their own. Seeing as I had a little secret tip from Santa that Connor was getting a kitchen set for Christmas I knew I had to find him some really great play food to go with it. The problem is after several trips to the local toy store we couldn't find anything that I considered worth wild as quality means everything to me as far as toys go! So many of the play food sets either just didn't look even remotely realistic or were so flimsily built that one little squash would have been the end of a toy banana! Thats when I realized that I saw some really awesome sets over at the Learning Resources website! Learning Resources was gracious enough to send us a set of Pretend and Play Sliceable Fruits and Vegetables to try out. I sort of cheated and let Connor play with it before Christmas and he spent a good three hours slicing veggies only to ask me for a huge bowl to put them in. What I didn't realize at the time was the reason he wanted a "huge" bow as that Mommy eats her salads out of those "huge" bowls as we call them. A few minutes later he brought me the most gorgeous little plastic salad I had ever seen, mostly because my baby made it for me! 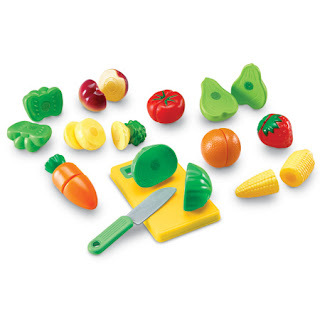 The set itself comes with a little cutting board, kid friendly knife used to slice the veggies apart, and a large selection of fruits and vegetables held together by velcro that you cut apart using the play knife. There is something just really satisfying to hear that velcro slice as you cut through them. Once your done just stick them all back together and they are ready to play again! We will also have an upcoming review of the Learning Resources Meal Time Playset which I'm beyond rediciously excited about receiving. Turns out that play food is super hot during the holiday season and our shipment was delayed, however if they are half as nice as the Pretend and Play Sliceable Fruit and Vegetables we are in for a real treat. My mouth is already watering at the thought of all those pretend meals I'll be served. Now only if I can teach Connor to make me a real meal. heh. While I wait for Connor to learn to cook for real, just kidding, you guys can pick up your own set of Learning Resources play food at the Learning Resources website!